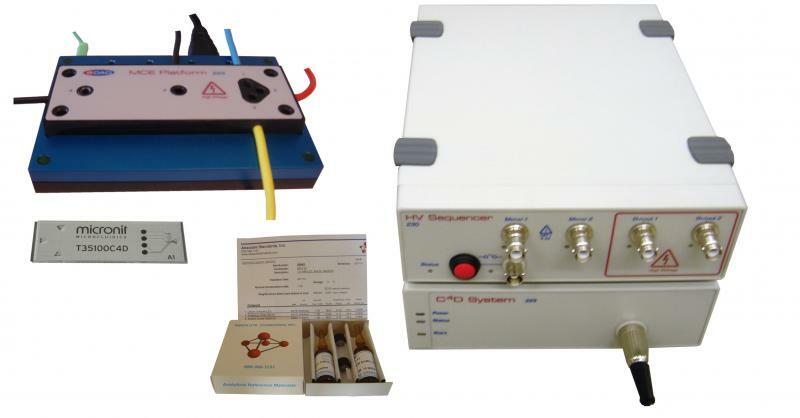 The ER455 is a system for microchip electrophoresis experiments. It includes the C4D Data System, High Voltage Sequencer (HVS), the chip platform, chips and documented test solutions. This system must be used with either ET145-4 or ET190-2 microfluidic chips. The system includes PowerChrom software for data collection and analysis, and QuadSequencer software for controlling the HVS unit for experiments with floating, gated or pinched injections. A procedure using the ER455 can been seen here. The ER490 is also a microchip electrophoresis system, but has the C4D electrodes on the platform rather than on the microfluidic chip.